The agrochemicals industry has come under increasing pressure to bring to market new, less costly, and highly effective crop protection products with reduced environmental footprint compared to traditional herbicides and pesticides. To respond to these challenges, agrochemicals manufacturers are exploring novel ways to innovate across the research and development pipeline. They are experimenting with cost-saving efficiencies in product development, scale-up, and manufacturing, and a variety of improvements to increase the speed and accuracy of analytical processes to enhance productivity. 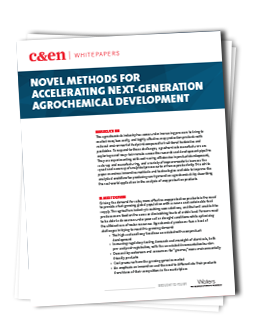 This white paper examines innovative methods and technologies available to improve the analytical workflow for producing next-generation agrochemicals by describing the real-world application in the analysis of crop protection products. Understand how agrochemical manufacturers are enhancing the speed and accuracy of analytical processes that will lead to cost-saving efficiencies in product development. View case studies utilizing the latest generation of LC-MS technologies to identify unknown components in complex agrochemical matrixes. Learn about robust purification and separation methods that can be used to isolate high-purity agrochemicals. Learn how to detect, identify, and quantify all metabolites generated by the active ingredient in a pesticide formulation.